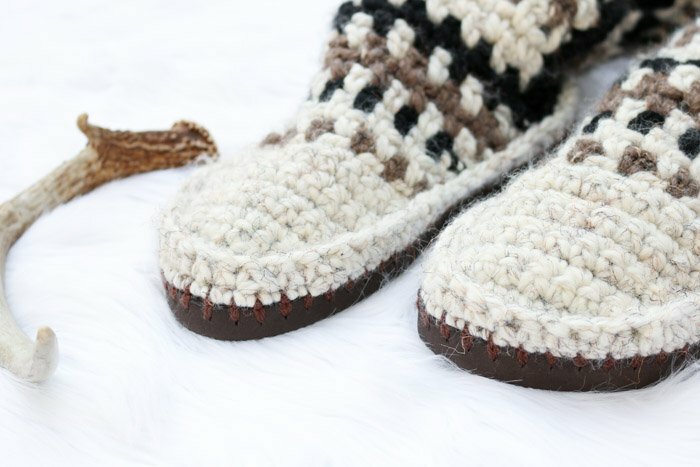 Keep your toes epically toasty in these mukluk style crochet slipper boots with flip flop soles. 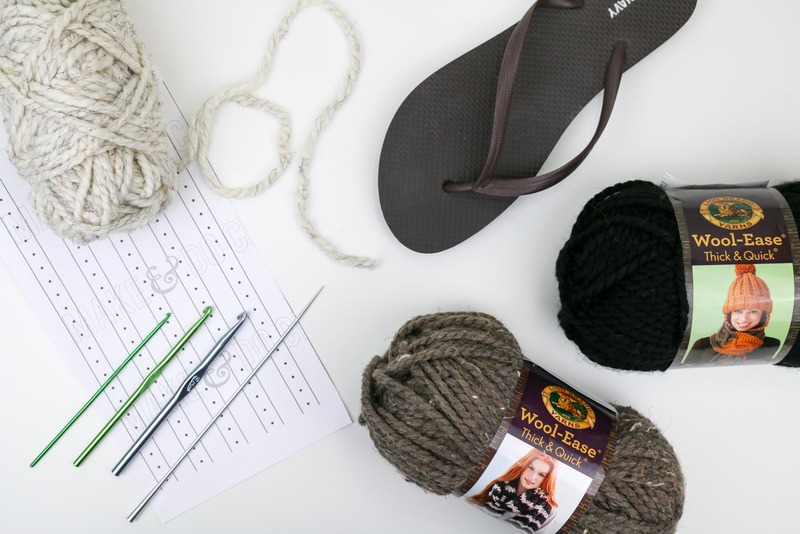 The mukluks are crocheted separately and then added to the flip flops, making this a perfect first crochet flip flop project. Get Part 1 the free pattern below or purchase the entire ad-free, printable PDF with ruler guide for $2.75 here. 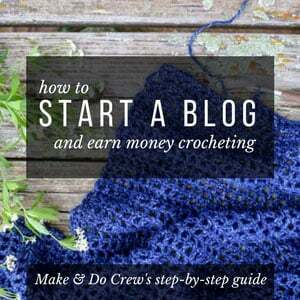 If you just show up here periodically to see check out the latest free crochet patterns, you might get the impression that I’m like a 3D printer of crocheting. Idea comes in, crocheted item gets squirted out. Well, I kind of hate to tell you, there is soooooo much more drama than that behind the scenes of Make & Do Crew. Periodically, I’m able to whip up a project that turns out almost better than I expected. But the vast majority of the time there is just…so…much…frogging. 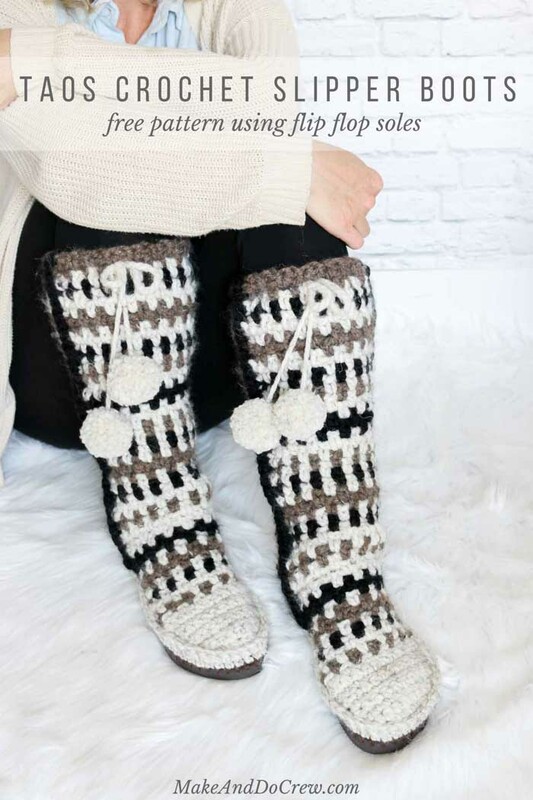 This free crochet slipper boots pattern is part of a collaboration with my friends at Lion Brand yarn. This post contains affiliate links. 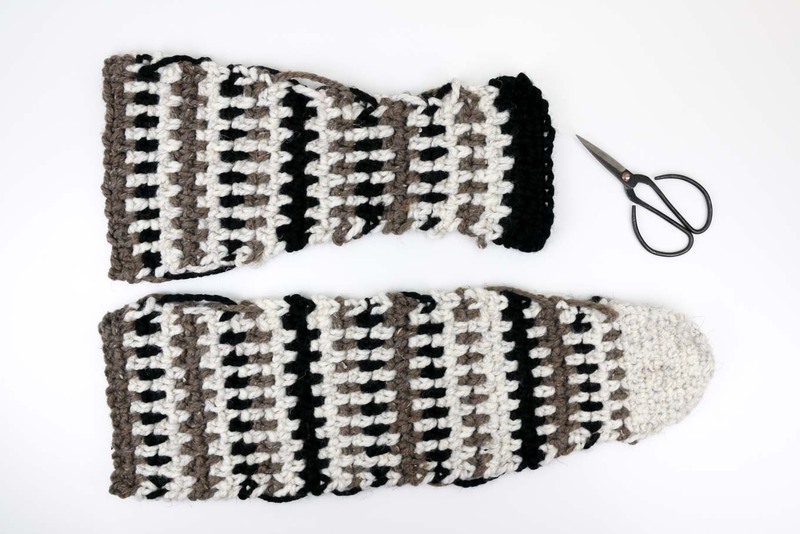 In the case of these crochet slipper boots, I originally had the idea of using the base of my Breckenridge Boots with flip flop soles pattern and add a woven stitch ankle section. I spent all of last weekend pursuing this direction only to complete one boot and decide it was not what I was going for. As much as it pains me to wedge a weird, random boot pic into this blog post, I think it can be really helpful and interesting to see where an idea began and where it ended up. So, if you don’t like mustard yellow and brown, quickly avert your eyes. While I really love each of these colors of Wool-Ease Thick & Quick separately, when I paired all three with the woven stitch, this crochet sweater boot just felt a little like a crazy autumn acid trip ala 1973. So I tore it all out and started over. 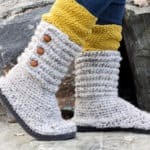 These crochet slipper boots are the first pattern I’ve created where most of the shoe is worked away from the flip flop and the rubber sole is just added at the end. It worked so well! 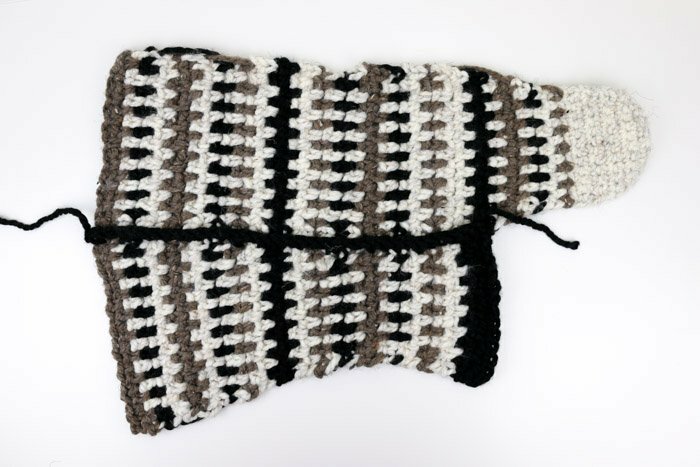 And if you’re totally new to flip flop crochet patterns, this is a great first one to try because you only have to work two rows on the flip flop. 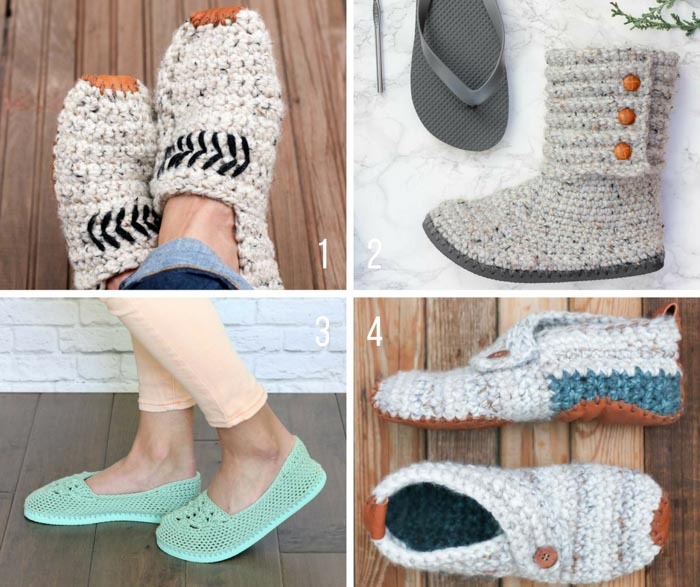 If you want to bypass the flip flop together and make sweater boots that are even more like traditional mukluks, you can simply crochet a basic sole, add two rounds of single crochet on top of the sole and then attach the boot just as the pattern describes. As I often do, I created a printable ruler to help guide the hole-poking on the flip flops. You can get this ruler for yourself as a bonus in the printable, ad-free PDF, which you can purchase for $2.75 here. Find Part 2 of the pattern here. • Transforming flip flops into slippers isn’t an exact science! Check out this Flip Flop FAQs post for answers to commonly asked questions. • You may want to size down when buying your flip flops. Look for a flop flop that offers about .25″ of sole around your foot (more like the fit of a normal shoe). • Left and right slippers are identical. 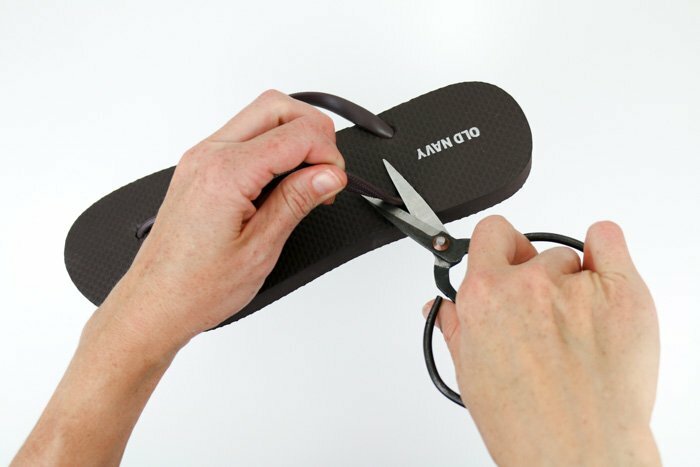 Trim straps off flip flops by cutting the mid-foot straps at an extreme angle so you can keep them in place without feeling them inside the shoe. (See photo below.) Tugging on the strap while cutting will help ensure you cut it as closely to the sole as possible. Save the rubber plug from the strap between your toes to glue in later. If using the printable ruler, trim ruler, tape pieces together and tape ruler around flip flop sole. With your sharp instrument, poke holes in each dot on the ruler. (See photo below.) Alternatively, poke holes every 3/8th of an inch around sole. Pierce the hole at an angle from about the middle of the way down the sole to approximately .25” into the top of the sole. Ensure your holes are far enough from the edge so that the yarn won’t rip through the rubber when you create your first row of crochet. Reference this video tutorial for help if you need a visual example. Using one strand of Color D, tie slip knot around smaller hook. 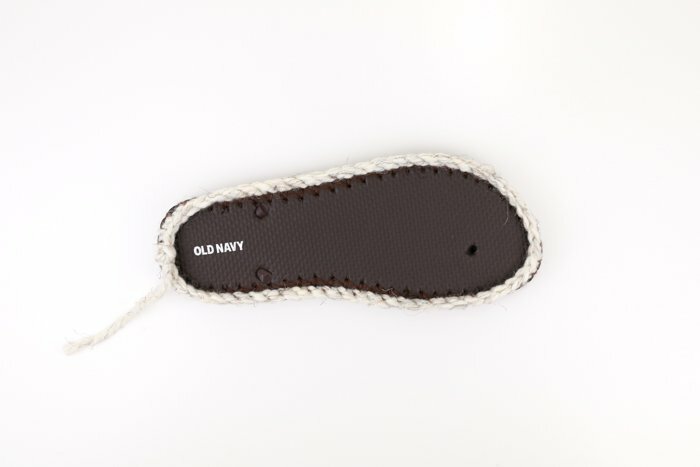 Insert size B hook at back of heel (6:00 position) from the top of the flip flop toward the bottom of the sole, grabbing the yarn and pulling through to the top of the flip flop and through the slip knot to attach the yarn to the flip flop. Foundation Round: Continuing with size B hook and color D, ch1, sc in each hole around sole, join with a sl st to first sc. Fasten off. You will work over yarn tails in the next section of the pattern. 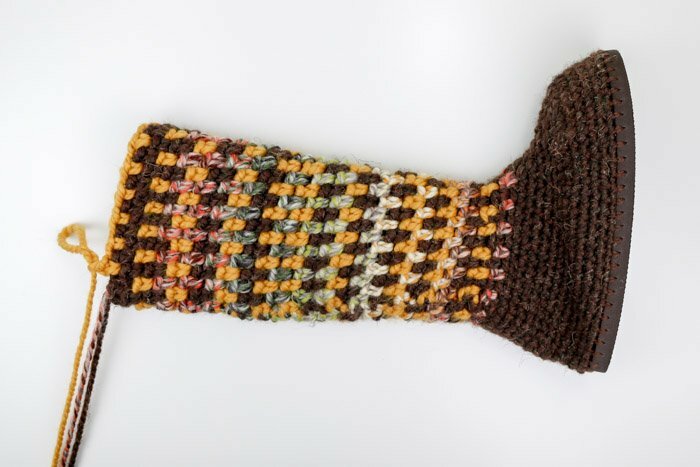 • IMPORTANT: The base of the boot is crocheted tightly, similar to amigurumi. • Crochet over tails from the foundation row as you go. Attach Color A at the 6:00 position. Switch to size K hook. Round 1: Ch 1, sc in each sc of foundation round, sl st to first sc to join. Repeat foundation round and boot base for second flip flop. • When working the stripes in this pattern, you have two options. If you’re picking up a new color of yarn that’s already attached on the same side of the boot from a previous row, you can either choose to cut the yarn and reattach in the new row, or just gently stretch the yarn up to the new position. Because the yarn between rows can be hidden on the inside of the boot seam, it could save you time to work this way. The downside is that it requires a little more diligence to tuck these extra pieces into the seam as you’re joining the boot pieces together. Shoe sizes 5-7, move on to Row 10. Shoe sizes 8-10, work Rows 8 and 9 as described. IMPORTANT: Switch to your size L hook. Beginning now, work color changes as described in the notes above. IMPORTANT: Switch to size N hook. Row 18 (WS): With Color C, repeat Row 15. Row 19 (RS): With Color C, repeat Row 11. Row 20 (WS): With Color A, repeat Row 12. Row 21 (RS): With Color A, repeat Row 11. Row 22 (WS): With Color A, repeat Row 12. Row 26 (WS): With Color C, repeat Row 12. Row 27 (RS): With Color A, repeat Row 11. Row 28 (WS): With Color B, repeat Row 12. Row 29 (RS): With Color B, repeat Row 11. Row 30 (WS): With Color A, repeat Row 12. Row 31 (RS): With Color C, repeat Row 11. Row 32 (WS): With Color A, repeat Row 12. Row 33 (RS): With Color B, repeat Row 11. Row 34 (WS): With Color A, repeat Row 12. Row 35 (RS): With Color A, repeat Row 11. Row 36 (WS): With Color C, repeat Row 12. Row 37 (RS): With Color C, repeat Row 11. Row 38 (WS): With Color A, repeat Row 12. Row 39 (RS): With Color A, repeat Row 11. Row 40 (WS): With Color B, repeat Row 12. Row 41 (RS): With Color A, repeat Row 11. Row 42 (WS): With Color C, repeat Row 12. Row 43 (RS): With Color A, repeat Row 11. Row 44 (WS): With Color A, repeat Row 12. Row 45 (RS): With Color B, repeat Row 11. Row 46 (WS): With Color B, repeat Row 12. Row 47 (RS): With Color A, repeat Row 11. Row 48 (WS): With Color A, repeat Row 12. Row 49 (RS): With Color C, repeat Row 11. Row 50 (WS): With Color A, repeat Row 12. Row 51 (RS): With Color B, repeat Row 11. Row 52 (WS): With Color B, repeat Row 12. Okay, it’s time to move on to Part 2 of the free Taos Crochet Sweater Boots pattern, which you can find right here! « Sedona Fringed Crochet Throw – Free Pattern! Your best yet! They are amazing!!! I am so glad you didn’t settle on the first try. I would like to make these in a solid color. Do I still need six skeins of yarn? Hi, I love these booties! Just made the Sierra for my daughter I put them on a rubber shoe sole with an insole. She said the heel slipped, I was wondering if you could help me come up with something I could do to prevent that. I didn’t know if making a double heel part to make it stiffer would help, excited to hear from you and your ideas. Can you explain a bit more about what you mean by “heel slipped”? I’m not sure I know exactly what you mean. I’m happy to help try to brainstorm if you can give me a few more details. Ooooh yeah, I seriously frog all. the. time.